In today’s modern home there’s a sensor, an app and a device for everything. You can brew coffee automatically, see who’s at the front door, feed your dog, shut the blinds and even control your thermostat with a connected smart device. But what about your yard. Nathan Cauffman has developed a new smart irrigation system built on the SmartThings platform that is ready to make managing the watering of your yard as easy as controlling the temperature in your home with a smart home. Eve and Adam is a two part system. Eve is the brains and controller around the irrigation system. 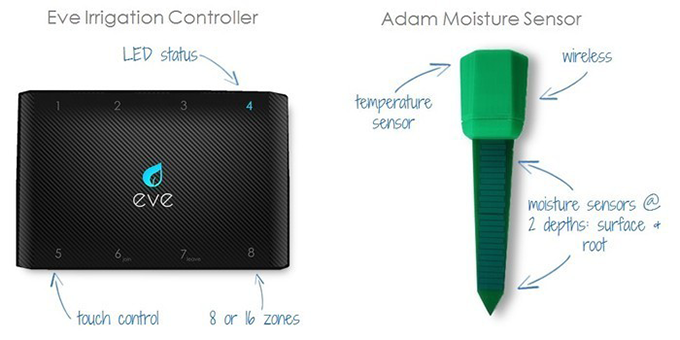 Adam is the moisture sensor that detects moisture at the ground level and at the root level. When working in tandem Eve and Adam make sure your yard gets enough water, but never too much. You simply place an Adam sensor in your different zones and as water is needed Eve lets your irrigation system know. 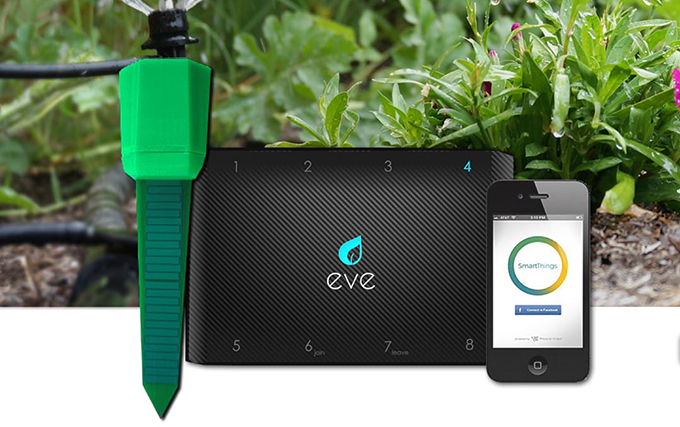 The Eve controller gives you manual functionality as well if you ever feel the need to interrupt your smart irrigation system. Of course all of this is handled on your smartphone through an intuitive app that asks just the right questions and lets you manage all the right parameters specifically to keep your yard looking nice and your grass and plants watered sufficiently. Within the app you set parameters like landscape type and which zones have Adam sensors. 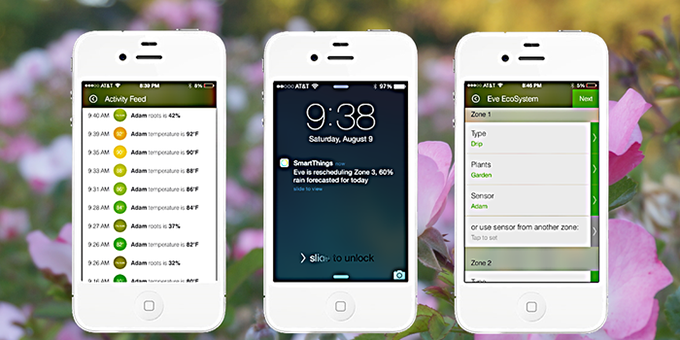 Eve takes that information and creates a watering schedule that’s customized for your yard. The Adam sensors measure water, and temperature and each Adam sensors battery will last up to a year make it incredibly easy to maintain. There are obvious benefits to the Eve and Adam system, like a more beautiful looking yard. But also, it helps save water. According to Cauffman most irrigation systems use 50% more water than they need to. Eve and Adam prevent that. The Eve controller has easy to use manual touch buttons and bright and clear LEDs so you can manage each zone.The system, built on SmartThings, means it will integrate with other smart home devices built on the platform. You can find out more about Eve and Adam here.